Based on Allen & Heath's acclaimed XCVI 96kHz FPGA audio engine, the SQ-5 digital mixer delivers extensive live sound mixing capabilities. Even with its powerful processing, the SQ-5 delivers best-in-class audio quality with less than 0.7ms of latency. You'll have a lot of flexibility when it comes to creating monitor mixes, with up to 12 stereo mixes (groups or auxes) in addition to the main LR out. Eight stereo FX engines provide studio-quality effects, with dedicated returns. Complete with a 32 x 32 USB audio interface, and dedicated controls for mixing convenience, the Allen & Heath SQ-5 is a smart mixing solution for live music, worship sound, and educational facilities. 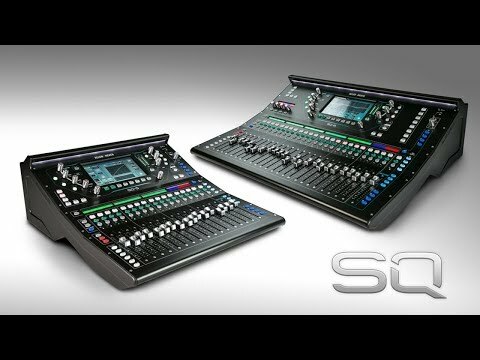 Right out of the box, the SQ-5 digital mixer offers 48 input channels. You have 17 faders for hands-on mixing, arranged in six fader layers for managing larger mixes. The SQ-5 also offers an SLink port for remote audio and expansion. And a 64-channel I/O port is ready for network audio integration. When you're mixing a multi-mic setup, you'll find the SQ-5's Automatic Mic Mixing capabilities to be a huge help. It's also a fantastic "safety net" when relying on inexperienced volunteers to manage the sound system. With Automatic Mic Mixing, you can be sure that you'll never experience an excessive imbalance between mic levels in large multi-mic applications. Multitrack recording is made simple with the Allen & Heath SQ-5, with its built-in 32 x 32 USB audio interface. Engineers at Sonido Live also appreciate the convenience of direct recording to a USB drive. A 64-channel I/O port is also present for connecting to network audio. And an SLink port allows for remote audio and I/O expansion.